Polaris has introduced the all-new RANGER Diesel for 2019, developed specifically for markets in Europe, Middle East, Africa, Australia and New Zealand. Debuting in dealerships this spring, the new RANGER Diesel redefines refinement with the introduction of a brand-new diesel engine and updated chassis, along with superior levels of comfort, handling and driving capabilities that make it even more durable, dependable and capable. Rodrigo Lourenco, Vice President and General Manager of Polaris Off-Road Vehicles EMEA, said: “We’ve taken the proven attributes of the existing RANGER Diesel model and upgraded almost every aspect so it’s tougher, more reliable and can tackle anything thrown its way. The new RANGER Diesel is made to perform to the highest standards for years to come. The all-new three-cylinder Kubota diesel engine is the most powerful engine in its class, delivering 24.8 horsepower and 40.8 ft.lb of torque. Paired with more consistent power and better torque distribution for a smoother ride, the new engine offers a lower cost of ownership thanks to over 200 hours between service intervals, plus a longer filter life and less oil consumption. With the highest top speed in its class of 65kph, the RANGER DIESEL is built for the heavy-duty long haul. The exterior design captures the essence of RANGER, boasting an aggressive style with its all-new one-piece chassis. More rugged throughout with reduced flex, the new chassis design is even more robust for an improved ride. Internally, the RANGER Diesel has enhanced ergonomics for ultimate comfort; the wider chassis seats three people with plusher seats, increased storage, and more legroom to get in and out of the vehicle easily. With all improvements being the result of customer usage analysis and feedback, the new RANGER Diesel has been developed for less engine noise in-cab and upgraded technology like a new digital gauge for a refined look and feel. RANGER Diesel is built for the job at hand, and every job after that. With 1134kg of towing capacity and a 720kg payload capacity, ‘capable’ only scratches the surface. The RANGER Diesel also has the highest ground clearance in its class of 33cm – a 20% increase from its predecessor. The new RANGER Diesel features on-demand all-wheel drive (AWD), meaning all four wheels engage automatically when the vehicle needs more forward traction and reverts back to two-wheel drive when it doesn’t. 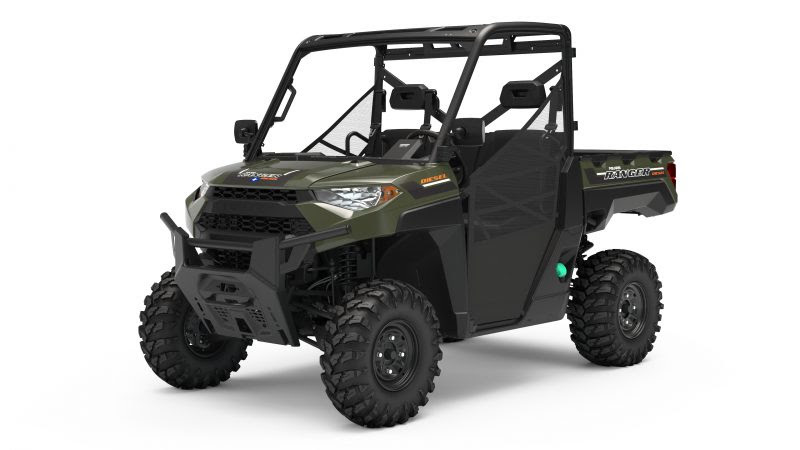 The electric power steering (EPS) lets you ride all day with less fatigue, and Polaris installed technology like the Engine Braking System (EBS) with Active Descent Control (ADC), controls downhill braking for smooth, controlled descents on steep declines with or without a load. Polaris is proud to offer over 200-engineered accessories to elevate every ride with the new RANGER Diesel. From cab systems to winches and plows, there’s an accessory waiting to make the RANGER work even harder and smarter. The RANGER Pro Shield Cab System offers three-times better dust sealing than the competition, with multiple windshield, door, rear panel and roof options to fit any situation. Featuring an improved door fit and tip-out functionality, the RANGER Diesel is better equipped than ever to get more done, year-round.